East Wick Service Wharf is a minor waterways place minor waterways place place on the waterways major waterways place village town city on the Lee and Stort Navigation (River Lee: commercial section) between Hertford Union Canal Junction (Junction of Hertford Union Canal and River Lee) (3¾ furlongs to the southeast) and Cheshunt Marsh Footbridge No 44 (10 miles and 7¼ furlongs and 7 locks to the north). 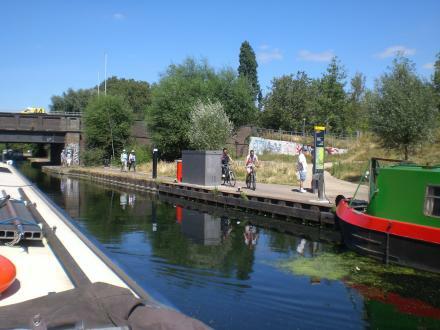 The nearest place in the direction of Hertford Union Canal Junction is East Wick Long Term Moorings (Permit holders only); ½ furlongs away. The nearest place in the direction of Cheshunt Marsh Footbridge No 44 is Eastway Bridge No 14A; ¼ furlongs away. East Wick Long Term Moorings&apos; pump-out and water point mooring is just south of the bridge, where the access to the towpath is from Lesney Avenue. A BWB key and pump-out card are required. Information last edited Wednesday the 17th of August, 2016 at 10:38 AM by Blue on Blue. Queen Elizabeth Olympic Park, London, E20 2ZQ — 1506 yards to the southeast. 106 Homerton High Street, London, E9 6JA — 1511 yards to the west. Britannia Works, Dace Road, Fish Island, London, E3 2NQ — 1228 yards to the south. 80 Eastway, London, E95JH — 258 yards to the west. 2 Chestnut Plaza Unit R1005, Stratford, E20 1GL — 1516 yards to the southeast. London, E20 1 — 974 yards to the southeast. Westfield, Stratford City 2nd Floor, London, E20 1ET — 1551 yards to the southeast. Westfield Stratford, London, E20 1EL — 1529 yards to the east. 23 Sherrin Rd, London, E10 5 — 1194 yards to the northeast. 303 The Loft, London, IG5 0AN — 1565 yards to the southeast. 14 East Bay Lane, The Press Centre, Queen Elizabeth Olympic Park, Stratford London, London, E15 2GW — 202 yards to the southeast. Olympic Park , Stratford, London, E20 2ST — 1311 yards to the southeast. London Stadium, Queen Elizabeth Olympic Park, London, E20 2ST — 1327 yards to the southeast. London, E9 5 — 1155 yards to the north. London, E13 9AZ — 1343 yards to the southeast. Queen Elizabeth Olympic Park, London, E20 2ST — 1202 yards to the southeast. Northern Retail Lifeline, London — 1002 yards to the east. Queen Elizabeth Olympic Park, London, E20 3AD — 974 yards to the northeast. Abercrombie Road, Queen Elizabeth Olympic Park, London, E20 3AB — 896 yards to the east. 58 The Street, Westfield Stratford City · London, United Kingdom, London, E20 1EN — 1438 yards to the east. Westfield Stratford City, London, E20 1EJ — 1407 yards to the east. Stratford — 1333 yards to the east. 6 Chestnut Plaza, Stratford, W12 — 1526 yards to the southeast. Queen Elizabeth Olympic Park, London, E20 3BS — 217 yards to the east. 3 Lesney Avenue, The Broadcast Centre, Here East, Queen Elizabeth Olympic Park, London, E15 2GZ — 493 yards to the east. London, E9 5 — 745 yards to the south. London, E20 3HB — 623 yards to the southeast. International Way, London, E20 1 — 1374 yards to the east. Homerton Row, London, E9 6 — 1511 yards to the west. London, E9 7DE — 1637 yards to the southwest. 92-94 Wallis Road, London, E9 5LN — 527 yards to the southeast. London, E15 2 — 1302 yards to the east. London, E3 2 — 1035 yards to the south. E20 — 1389 yards to the east. 90 Main yard, Wallis Road, hackney Wick, London, E9 5LN — 493 yards to the southeast. London — 1510 yards to the east. Westfield Stratford City 2nd Floor, London, E20 1 — 1556 yards to the southeast. 2 Stratford Place, London, E20 1EJ — 1519 yards to the east. Westfield Stratford City, 2 Stratford Place, Stratford, E20 1 — 1539 yards to the east. Unit 3 Canalside, London, E20 3 — 112 yards to the southeast. Queen Elizabeth Olympic Park, London, E20 3HB — 614 yards to the southeast. Queen Elizabeth Olympic Park, London, E20 2AD — 1507 yards to the southeast.